Football fans threw fireworks at police after Northern Ireland's World Cup qualifier against Poland in Belfast. Between 50 and 60 Northern Ireland fans clashed with police at a roundabout at the bottom of Tates Avenue, outside Windsor Park football ground. Police said nine people, the majority of them Polish, were earlier arrested after trouble at a city centre pub. The match, which Northern Ireland won 3-2, was briefly halted after an object thrown from the crowd hit a linesman. Fireworks, bricks and bottles were thrown between the two sets of fans outside the stadium, and it is understood several people were injured during the disturbances. Riot police in armoured Land Rovers were deployed as fans made their way to the ground, and residents were advised by police to stay indoors. During the game play was suspended for five minutes after a linesman was hit on the head with a small object thrown from the crowd. Northern Ireland Sports Minister Gregory Campbell, who was at the game, told BBC News one confrontation began after some Polish supporters unfurled a republican flag. He said: "There were some Polish fans who introduced one of the Irish republican flags, that are supportive of the group that killed the soldiers and the policeman a few weeks ago, which obviously then led to even more tension. "I suspect and heard that there were further scenes of violence then immediately after the game." Trouble started in the city centre shortly before 1500 GMT on when Northern Ireland and Poland fans gathered in the same Wetherspoons pub on Bedford Street. A Wetherspoons spokesman said he understood it began following an "altercation between a Polish fan and a local". The spokesman estimated damage which could run into thousands of pounds was caused, and the premises was closed. 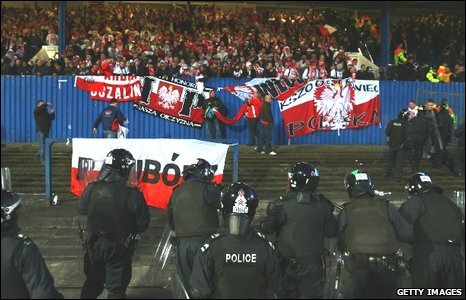 The Polish fans were kept inside the ground for nearly an hour after the match, which kicked-off at 1715 GMT. The incidents marred a great result for Northern Ireland, who moved to the top of their World Cup qualifying group.